Cleaning out my closet is MUCH more productive now that I have a consignment shop to take stuff to. They donate whatever clothing they won’t sell, so I only have to make one stop. I used to clean out my closet a couple times a year when I donated, but knowing I will make a little extra cash is GREAT incentive to ditch items that I put on and think “eh, I don’t love this.” So into the consignment pile it goes! I’m stuck in a cycle of “being happy with my body” and “wanting to lose weight” and “finding the time/energy to make it happen.” I AM happy with my body. I’m a size bigger than I was last summer, but ultimately, I know I’m healthy. I know I can be healthy at a size 12 just like I can be at a size 10. I feel good. I can run, workout, have energy to make it through my day, my bloodwork is good, etc….but I still would like to ditch some pounds. But man, it’s hard work! I have a whirlwind couple of weeks ahead. I love being busy, but I enjoy down time too. I’m lacking in that for the next couple of weeks, and I’m starting to feel a little anxious about it. I got a spray tan last night (prep for the wedding this weekend!) and I love feeling tan. I’ll NEVER go back to the tanning bed, but I love a little fake bake. I’ve been doing some social media promotions with BlogHer, and it’s so fun to have these little side projects going. I think I’m going to start T25 (again) when I get back from San Diego. For the month of April, I’m really going to commit to doing it. Really. Like an entire month of it. If nothing more than I know it will improve my running speed with all the agility workouts. And that’s all I have in my head. Happy Thursday, pretties! Totally LOVED my spray tan last week! I just wished it had lasted longer! So I’m going again today for Vegas this weekend. Hopefully it will last thru the weekend! Super cute hairstyle!! Chop the hair! I did it two weeks ago and am SUPER happy with my decision! Plus- spring is for light, happy, fun hair, right? I’m also on the donating/purging bandwagon. I have unloaded SO much stuff! I am in Fort Smith. Where did you get your spray tan?also, what consignment shop do you use? Love your blog and would love to meet you someday. Sounds like you are busy for awhile. Blessings. totally feel you on the working out/body/weight thing. feel likes its a constant juggling/struggle for me. 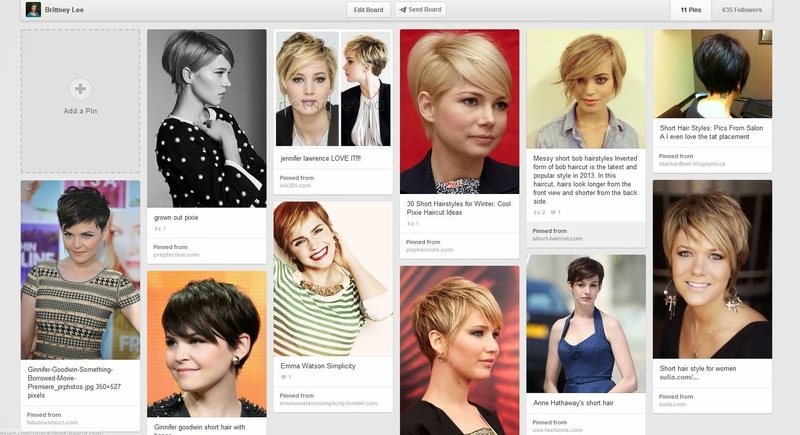 also LOVE those hair cuts… the best thing is that hair grows, but i like being risky and daring with hair. its too fun not to be. hope all goes well these next few weeks! i have enjoyed keeping up with you! love! I was checking out Hanson.net earlier this week. You can “friend” people on there- and I only have a few “friends” whose activity I’m interested in. In the corner, it tells you whether or not you have friends online. And I saw this! ZacHanson (the real one!) was online. I SO wished H.net had a chat feature at that moment! ha! Last night I did 4 miles on the dreadmill treadmill. I had only walk/ran 3 miles before, so this was my longest workout. My legs are sore. I got a SUPER cute new Sparkling Sage necklace from Rue La La in. Wearing it today. This is my second piece from them and I LOVE it. I may just have to buy some stuff directly from Sparkling Sage instead of waiting on the sales. What’s going on in your world? What show will you watch tonight? For us, it’s Burn Notice and Graceland night! I love the new necklace!! Oh I LOVE SYTYCD! It’s one that I love watching on my lunch at work! I’m not totally sure what will be on my watch-list tonight. Motive, huh? Haven’t seen that one….but it sounds interesting from previews I’ve seen. Here are some bullet points from this week. It is crazy to me that now I get paid to be a blogger! 🙂 Not on this blog, but THIS blog! I am writing selling our moving service, and so far my few posts are bringing in the moving quotes (like they are supposed to!). It feels good to have a job I am good at that is so enjoyable. I am so thankful for that! We moved into a new building at work. Our desks are along a back wall that has leaked in the past. This makes it smell a little mildew-y. I bought a cute little air freshener at Staples that looks like a flower! I LOVE how fun it looks on my desk (along with my high heel tape dispenser!). Last night after Zumba and dinner, we watched some TV. And I fell asleep on the couch. I hate doing this, but I get so comfy laying there under my blanket. I did hold out until like 9:30 before I fell asleep, and Tyler woke me up at 10:15, but that is 45 I could have either spent time with Tyler or done something productive. Oh well. Falling asleep on the couch is a MUCH rarer occurance now that I have cut my Zumba classes back. Tonight, I AM going to finally put all the laundry away. I HATE laundry. It never ends. I put up all the folded stuff last weekend and Monday, but the hanging clothes (along with 2 loads that are still in the dryer waiting to be folded) need to be put away. Gotta get it done. I chose not to pack a lunch today, but to hit up Chick-fil-A instead. Our new work building is on the other side of town….just down the street from Chick. I think a once a week visit is necessary to my well-being. I LOVE their tortilla soup. For lunch, I get a medium tortilla soup, a medium fruit cup, and 6 piece grilled nuggets with a diet lemonade. ALL that for 440 calories. At our old building for work, there was an outdoor walking trail. It was pretty nice. It went around the building and was in a beautiful wooded area. It was gravel and had hills (read: difficult to walk in dress clothes). We would go on walks 1-2 times a day for a little break from work. The new building is in town (it is an old Best Buy building), so there is no pretty trail. However, we made a makeshift trail down the street and around a nearby hotel. It is a .5 mile loop. We walk this at least 2 times a day (either 2 laps on a long break or 2 short breaks with one lap each). I LOVE sneaking in a little one mile walk during the day. Hope it speeds up my weight loss a little! Even if not, its refreshing to get outside for a little bit and fun to talk with my coworkers as we walk. Have a beautiful Thursday loves! You can get grilled nuggets at Chick Fil A?! How did I not know this? I have seen several bloggers do random Thursday posts…and my thoughts are pretty random today, so I’ll join in. -My office at the dealership is where all the computer servers and such are houses. One of the battery-server-things (I’m super technical, try and keep up) is overheating and it smells. Like burning plastic. The smell makes my eyes water and gives me a headache. This is day two of smelly office. We have a fan blowing on it to keep it cool, but surely there is a solution that doesn’t involve a dusty fan blowing in my office, only blowing dust and smell. -This morning I woke up early (like I’ve been doing) to walk and do my Bible study. Well I did my study, but my legs were so sore from this weeks workouts, so I decided to do dishes and put dinner in the crockpot. I was about 1/4 of the way through the dishes and the left side sink (the side w/o the disposal…so it has that X sink stopper that has to be manually cleaned when gunk gets in it) was draining slow…so I stuck my hand into the water and started to dig out the gunk. And something (still don’t know what) cut about an inch long gash in my middle finger on my left hand. It took over an hour for the bleeding to stop. As I held a paper towel on it, I finished dishes and started dinner with one hand. I couldn’t shower or wash my hair because my hand was gushing blood. I had to do my makeup one handed. Finally on the way to work it stopped bleeding…but it is super tender and hurts to use it. -The Wonder Years is on Netflix streaming. I loved that show growing up and am so glad I can watch it again. -I’m wearing some previously too-small jeans! PTL. They are some Lucky brand skinny denim trousers I bought from Rue La La and while they are quite snug (its ok, they are skinnies) they fit today! Woohoo! -Mikey loves to roll onto his back as you walk by. Who can resist this adorable-ness? He always gets a belly rub when he is laying on his back. This was him this morning being cute. -I’m having a hard time picking out what to wear this weekend to Homecoming. Do I dress cute? Dressy? Casual? Do I wear flowy (what is comfortable to me) or do I dress to show off my weight loss? Too many decisions. -The cape came in. It looked too Disney-princess-in-winter and was not practical. Arms exposed to the cold? Not good for a jacket. I’m sending it back. Whatev. -We had only one lady at Zumba last night again…but it was a DIFFERENT lady. I asked the owner to send out an email about the class and I’m going to make some posters to put up. I know in a couple months I will have a class and forget all about this limbo of “will there be people there? will I get to keep teaching at this gym?” God will provide. I’m trusting. And those are my randoms for today. 🙂 Happy Thursday! fun random post!I love mikey! and the wonder years used to be one of my very favorite shows!!!! =) congrats on the jeans! that’s such a good feeling! id totally come to your class if I lived closer and if my knee was completely healed. I LOVE zumba!